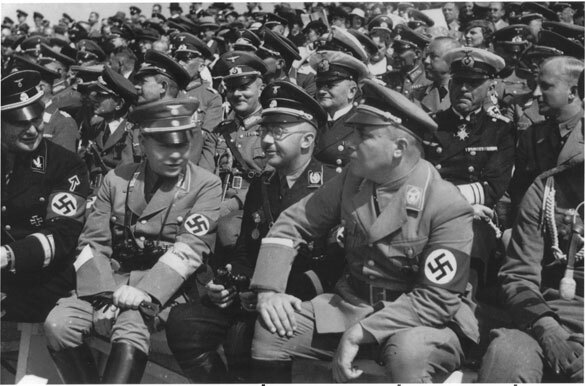 Heinrich Himmler (black uniform, in center) sitting with Martin Bormann (with hand on knee, right of Himmler.) 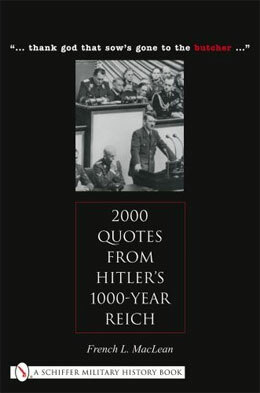 Himmler, Reichsführer of the SS, said of Bormann, “I hope I can succeed in outmaneuvering him without having to get rid of him.” Bormann, Reich Leader of the Nazi Party, understood his position of power and said, “He who holds the Führer’s confidence, fundamentally needs neither rank, nor title nor decorations.” Himmler committed suicide by taking poison shortly after the British captured him on May 23, 1945. Bormann probably either committed suicide or was shot by Soviet troops a few blocks from Hitler’s bunker on May 1, 1945, although numerous post-war sources claimed Bormann escaped to South America.